All Ocean Park homes currently listed for sale in Ocean Park as of 04/19/2019 are shown below. You can change the search criteria at any time by pressing the 'Change Search' button below. If you have any questions or you would like more information about any Ocean Park homes for sale or other Ocean Park real estate, please contact us and one of our knowledgeable Ocean Park REALTORS® would be pleased to assist you. "Built to height limit, home has 180 degree views of ocean & captures dreams immediately! 2 masters w/en suite, baths & views! Great room has fireplace, bath, kitchen w/ walk-in pantry, maple cabinets & plenty of storage. Hurricane windows throughout. Private guest studio living, entertainment room, you name it, lower level. Enjoy ocean views from ALL floors! Outside amenities include cold & hot water, 500+ sq ft. deck, 1+ garage." "Luxury home w/ 3 levels of stunning ocean views! Perfect for families/vacation rentals! Top floor: 2 Master suites w/ ensuite baths, loft, nook; 2nd floor: great room w/ gas fireplace opens to huge deck, gourmet kitchen w/ granite counters, maple cabinets, bathroom, laundry; 1st floor: large studio/play area with closet & full bath. Patio & firepit. Hurricane strength windows. New heat pump and exterior paint. Partially furnished." "Mean High Tide ocean front property, access and a view. Remodeled 2 bedroom, 2 bathroom home with an additional space downstairs being used as a guest bedroom. You have a 771 square foot Trex deck to enjoy your ocean front property. 3 French doors flow from the front of your home. This home has so much to offer, new roof, new siding, updated kitchen, floors and bathrooms. RV hook-up with all 3 utilities. Dreamy path to ocean." 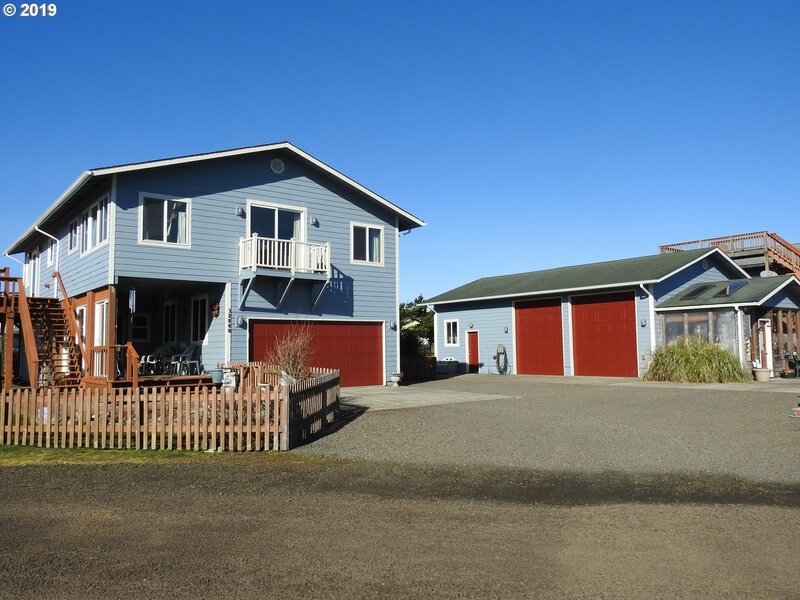 "Custom 3Bed-3Bath Home,Ocean Views,2130sqft. Main living area w/New propane stove, updated kitchen, open LR w/vaulted ceilings,Dining rm w/dbl slider to LG deck. Master suite w/jetted tub,dbl vanity, private deck,walk-thur closet+french doors to adjoining office.Lower level 2 lrg bdrms ,full bath+mud rm.New Paint,New ductless heat pump for whole house High Efficiency Heating Tankless On demand WH,Generator,2 car gar+separate HUGE SHOP"
"Simply oceanfront. 60ft of Western Upland Boundary Frontage with the beach just 123 heartbeats away. Light-filled rambler with views of watercolor sunsets and dancing dunegrass with the lull of the sea always in the background. Shiplap vaulted ceilings, wood burning fireplace, open floor plan, 3BR/1.75 bath. 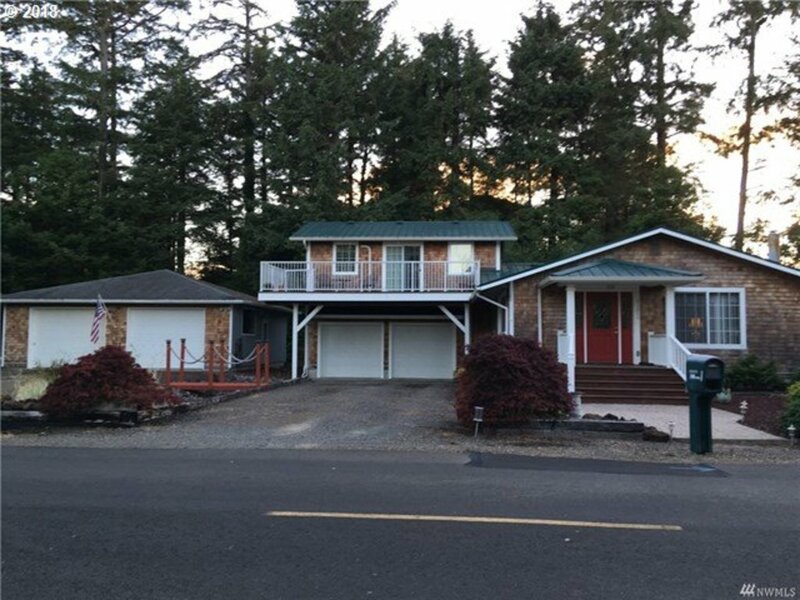 Double garage plus a huge carport that offers covered outdoor enjoyment year round. RV parking spot, fresh paint clean and tidy." 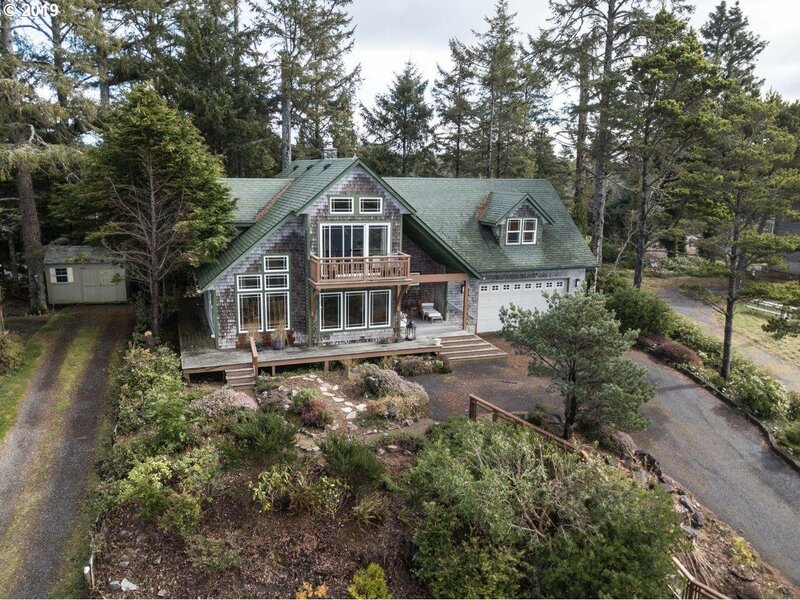 "Situated against a background of tall fir trees, this OCEANVIEW, Craftsman home, filled wi/custom slate, clear grain maple flring, granite, & beautiful woodwork. The radiant Finnish fireplace provides a rustic, lodge feeling, & heats the whole house. Great room w/well arranged kitchen, new granite counters accent the Shaker panel, maple cabinets, den/office doubles as bedroom, 2nd story Master, loft family rm, and bonus room." "New construction by Burnworth Property Development Jim Burnworth Homes, hydronic Floors, Covered rear porch, 2 car garage, play area with fireplace, horseshoe pit. Open Floor plan, high & vaulted ceilings, concrete floors, and counters island kitchen, large tile master show, dual master bath sinks. Many unique features, contact for details. Tranquil setting with trees, Quick beach access, fishing, let the adventures BEGIN!" "Live near the ocean and live on Surfside Golf Course. This is the home to retire in! 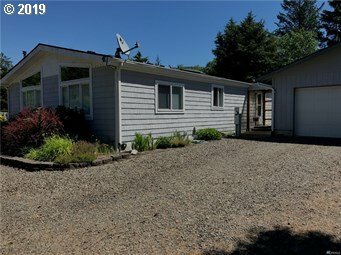 Single story, under 2,000 square ft with a 4 bay detached garage/shop large enough to store your boat, RV and classic car(s) and all of your toys. Not to mention a second detached 2 car garage for your everyday runners. Need a little elbow room? 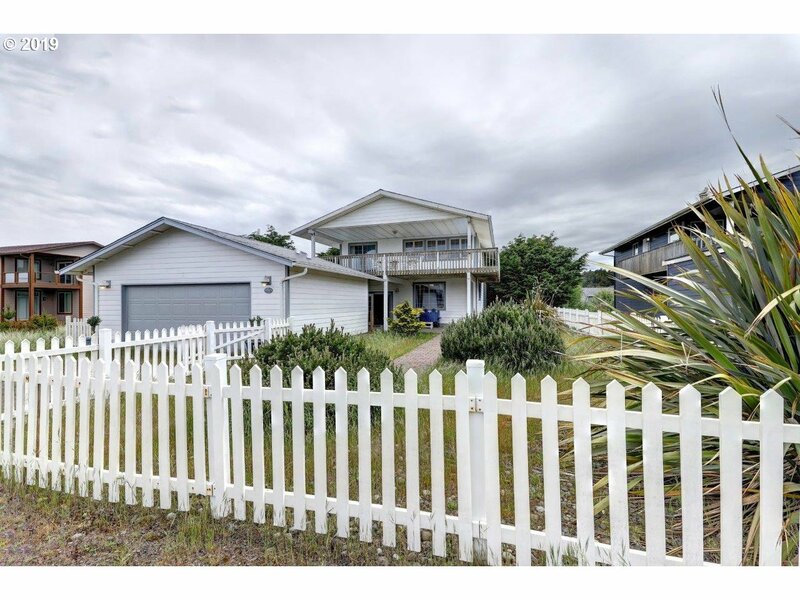 This home has three parcels of land. This is must see home, it will not last long. See it, Love it, Buy it!" "Charming condo with stunning ocean views! This beautifully updated 2 bedroom, 2 bath end unit features hardwoods throughout the main floor, vaulted ceilings, large loft area with additional bonus room, and ample natural light. Enjoy beach access right off the back deck. This one is light, bright, and ready for viewings!" "High on the East side of J Place with a fantastic view of the ocean is this 2 bedroom 2.5 bathroom home. Equipped with a ductless propane stove that keeps the bonus room warm on those winter nights. Upstairs is a very nice laid out kitchen with a bar to sit at or settle down in the couch in the living room and gaze out at the sunset. Kitchen is equipped with stainless steel appliances and deep double sink." "Sick of crowded campgrounds? Can't get everyone together? How about this! 2008 2BR lodge-style 1200sf home on 2 acres of pure natural enjoyment. This amazing retreat features an outdoor kitchen, covered patio with big screen tv, fish cleaning station, 3 full RV hookups plus room for more, bunk house, laundry/bath house even an outdoor shower. Fire pits, horseshoes, neighboring trails - everything you need for the full beach experience!" "OCEAN IN VIEW! NEW, NEW NEW inside! Interior paint, flooring which includes Armstrong, waterproof flooring throughout most of the house! Sparkling kitchen sports new cabs, quartz counters, farmhouse sink and Samsung SS appliances. New heat pump/furnace, LP gas fireplace, water heater, bathroom updates and plush bedroom carpets. Graceful, arched great rm ceiling adds a warm touch to this spacious area. South side sunroom. One level!" "Beach Cottage Charm just across the street from the sea! 4BR/2BA on the fish-stocked canal. Freshly updated with brand new rustic flooring, interior paint, new vanity, new stove, new doors and enjoyable inside and out. Giant upper deck is perfect for sunsets and BBQ's, back deck gives you ducks, otters and heron viewings plus fishing! 2BR/1BA up, 2BR/1BA down, large family room opens wide with double french doors, detached double garage"
"This is the place you have been looking for. Over 5 acres with a 3 bedroom, 2 bath home ready for you! Multiple buildings on site, granary, chicken coop, hay barn, livestock shed, 3 smaller shelters. The property is about a mile from the ocean and about a mile to the bay, the best of all locations. One could ride their horse to either location. The east edge of the property is in a designated evacuation area in the event of a tsunami." "Dream Home,Dream SHOP! 3 Bdrm+Office+2 full bath 2,000 sqft.Kitchen w/island & eating bar, Dining rm w/access to deck. Large media rm w/wood burning fireplace & good size living rm.The Large Master ensuite has lg walkin closet, great bath w/huge tub & walkin shower. Wonderful big covered porch in back for BBQ-ing or Hot Tub-in? The WOW SHOP is 40X60 W/RV Parking, w/still rm 4 Boat & still rm for 3 cars has it's OWN Septic/Kitchen/bath." "1500+ SF one level on 2 Surfside Lots! Not a manufactured home! Detached 16x40 shop with power & 12ft tall garage door. Crows Nest Deck for Ocean & territorial views. Vaulted living room with propane fireplace. Oversize kitchen with lots of storage. Large master bedroom. 2 car garage. HOA dues include water and garbage services. Don't miss this opportunity for a wonderful beach home." "This beautifully remodeled home with hardwood floors, plantation shutters,vintage doorknobs, wainscoting, mini blinds & glass front kitchen cabinets are sure to catch your eye. Enjoy the double oven and propane stove top cooking and two wood burning fireplaces on the main level. There is a fenced backyard and an electric car charger ready for use. Its a quick walk to the beach or into downtown Ocean Park." "SINGLE LEVEL HOME PLUS AN EXTRA LOT lot that has it's own well and septic. 3BR/2BA Partial ocean view from inside but great view from double deck - adjacent lot also has a view. Beach access 3 blocks away. NO HOA dues,well and septic keep costs down. Wood fireplace, entry room is large and can double as a sleeping porch. Pantry area has great storage and even a little hobby workshop attached.New siding new decking fresh paint." 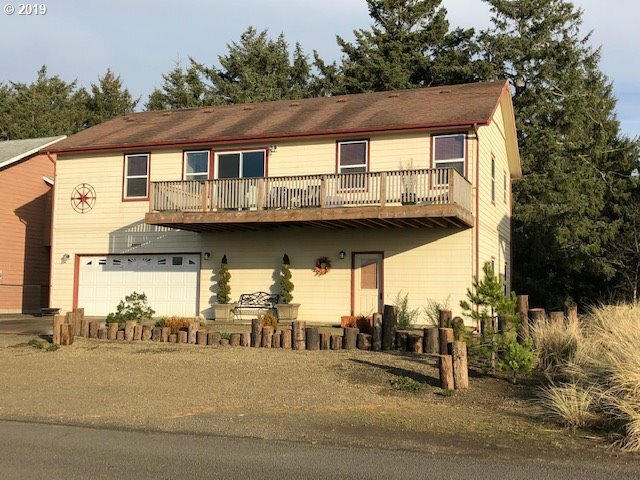 "Historical Oysterville has to offered this custom home, built by John Buell Quality Construction, sitting on almost 2 acres giving you a very peaceful setting. 2 bedrooms, 1 & 3/4 baths, +bonus room down, hardwood floors down & carpet up. Kitchen w/soft close cabinets. French doors lead out to a wrap around deck, relax, read your favorite book and enjoy life. 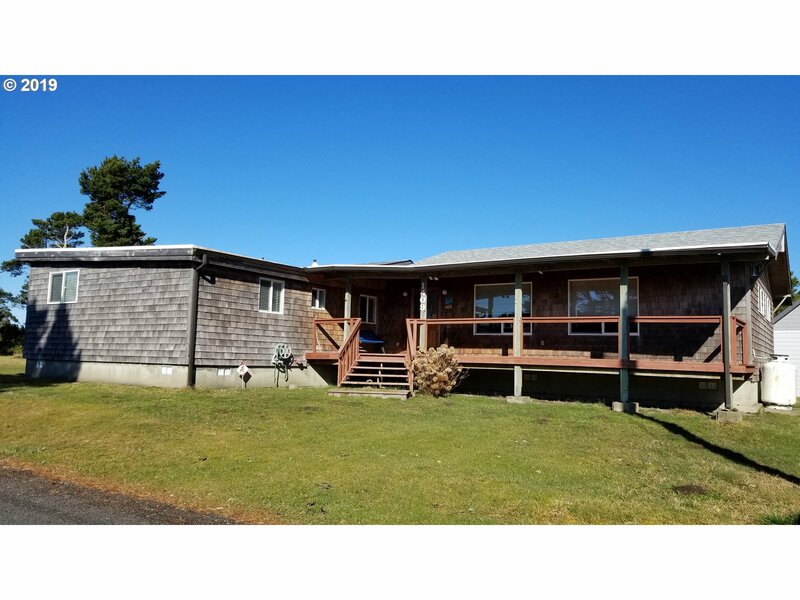 Offers best of both worlds - Pacific Ocean & Willapa Bay." "If you want a shop to play in AND a nice remodeled home, this is it!! This 2 bedroom home has newer siding and appliances, with a master suite upstairs with sliders going to the Trex deck. New heat pump and garage door openers. The shop has 2 bays separated by a wall with their own doors. Work on that hotrod in one bay and woodshop in the other!! Low maintenance yard with firepit. Many recent upgrades in this house." "Magical One Level Living at the Beach! 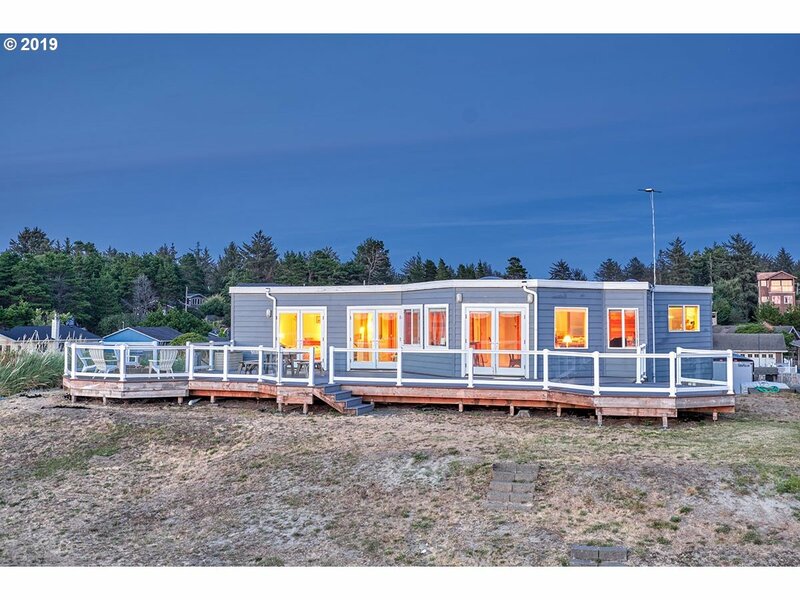 2018 built energy efficient rancher, west side of Pacific Way with beach path access. 3 bed 2 full baths with utility room and 2 car garage. Granite counters, stainless appliances, Aristokraft cabinets, luxury vinyl engineered floors. Darling and durable HiLineHome - high wind roof package, Cemplank siding, lifetime Milguard windows, Mitsubishi Heat Pump. Move in ready!" 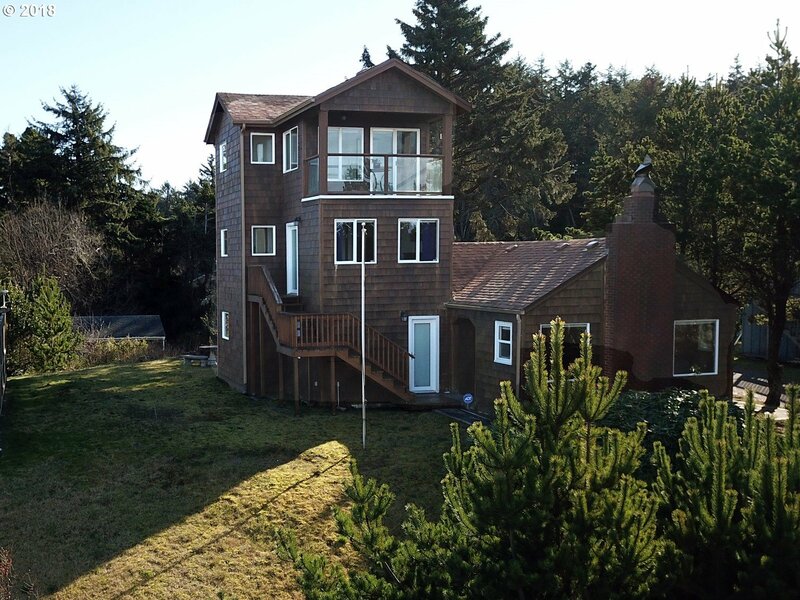 "Cedar sided rambler with the heart of a true beach house. Clean and adorable, NEVER BEFORE OFFERED ON THE MARKET! 3BR2.5BA single level home on the northern outskirts of Long Beach. NOT a mfg home! Wonderful open floorplan, perfect for gatherings and quality time at the beach. Built to enjoy in all kinds of weather. Huge covered porches front and back, vaulted ceilings, propane freestanding stove and very little yard work." "Coastal beach home. A beautiful blend of the 40's cozy comfort and modern addition. Tri-level, w/living space on all levels, 3 bdr/1.5 bath, bonus rm w/balcony and all w/in short walking distance to beach. Plenty of storage in this remodeled home. 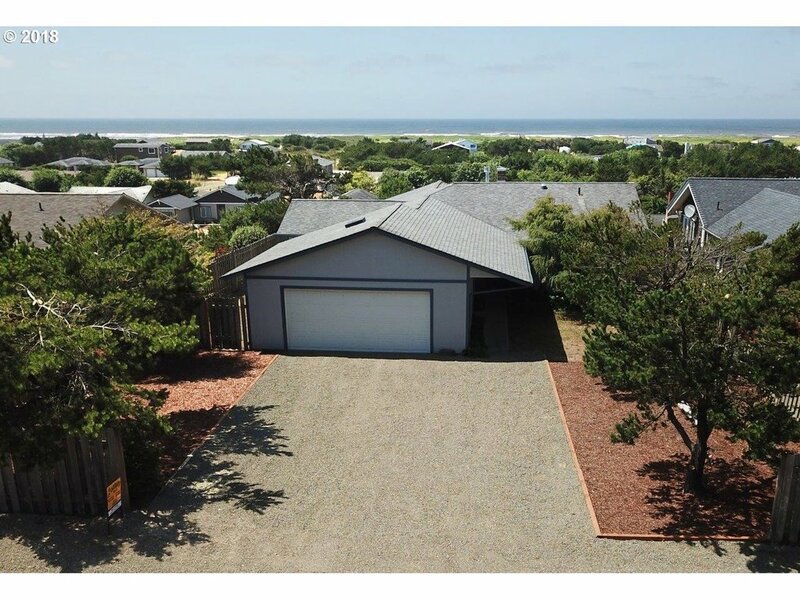 Lg lot with storage shed, fire pit, and trees offer some privacy, yet watch the sunset over the ocean. Furnished w/appliances included. Great getaway home! New Driveway." "Plenty of room for your ideas. 20,000 sf property with a nicely maintained 2 bedroom, 2 bath home. All Appliances stay and 3000 Carpet allowance , new Roof and New Fence . Newer heat pump, water heater. Huge finished garage with workspace and hobby room. Plus plenty of storage in garage attic with pull down ladder access. Extra lot is cleared and has a septic which will probably work for your RV guests. Or maybe you want a shop? Or you"